There’s a new breed of celebrity, and not only can they teach you how to cook like a pro, but they also entertain like a prime time show. Have you been to the organic garden of Jamie Oliver to make homemade ketchup? Practically smelt the aroma of Bobby Flay‘s spice-laden meal from his apartment’s balcony grill? Or longed to taste chili crab at that Singapore roadside eatery with Tony Bourdain? Well then you probably know what we’re talking about. Nigella, Ina and Giada. Tyler, Rocco and Mario. There are few who haven’t heard of these household names people whose shows on television and whose cookbooks have given them super celebrity status akin to the Hollywood elite. And they don’t even have to own a restaurant or don a chef’s hat. In fact, they don’t even have to be seen cooking, strangely enough. Its fascinating stuff, and we here at Splashpress Media have a tasty blog that covers this delicious phenomena. 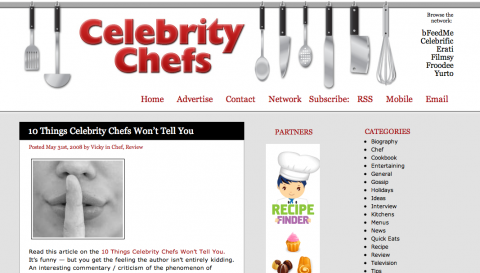 Newly redesigned by Randa Clay, and updated by the saucy Vicky Sanac, Celebrity Chefs gives you the latest news and interesting information from Alton Brown to Wolfgang Puck . Learn the favorite recipes and tips of your favorite chefs, be in in the know with the juiciest gossip (did Gordon Ramsay really eat that chef’s thumb? ), products (how hot is Emeril‘s new deep fryer?) and culinary programs (No Reservations new season?). If there’s anything at all happening in the world of celebrity chefs, we’ll be blogging about it.